Note: A stock part of the NT class I regularly teach is discussion on the views on slavery in the ancient world and in early Christianity. I usually stress the pre-Christian “natural slave theory” of Aristotle, who offered the well known observation, rightly much offensive to modern ears, that slaves were mere “talking tools.” I then contrast this with the more egalitarian views of early Christianity, as reflected in places like the household codes (cf. Eph 5-6; Col 3) and in Galatians 3:28. I also stress that although early Christianity was not a social revolutionary movement and did not advocate the immediate overthrow of slavery (cf. Paul’s views in 1 Cor 7:20-24 and, especially in Philemon), it did contain within it the seed that led to the flowering of abolition, at least in the West (cf. already the denunciation of “menstealers” in 1 Tim 1:10 and of those who traffic in “slaves, and souls of men” in Rev 18:13). To learn more, I recently read Peter Garnsey’s book Ideas of Slavery from Aristotle to Augustine. Garnsey’s work is noteworthy for pointing out criticisms and challenges to slavery even in the pre-Christian world. He also makes some interesting parallels to the defense of slavery in the ancient world and in the antebellum American South (including the appeal of some pro-slavery Southern intellectuals to classical thinkers, like Aristotle). Oddly enough, Garnsey finds less to affirm in the role of early Christianity in opposing slavery. For him it is a mixed bag. Though he notes the views of Gregory of Nyssa in opposing slavery, he places emphasis on the more status quo affirming views of Augustine and others. Garnsey seems to ignore the obvious, however, that the rise of Christianity eventually led to the decline of slavery in every culture where it had influence. 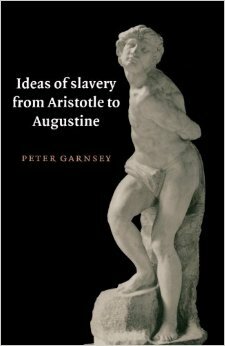 Peter Garnsey, Ideas of Slavery from Aristotle to Augustine (Cambridge University Press, 1996): 269 pp. This book is a revised and extended edition of Garnsey’s 1995 Stanford lectures at Trinity College, Dublin. As the title indicates it provides a survey of views on slavery in the classical world, from the ancient Greeks to early Christianity. He suggests there have been few “slave societies” like that found in ancient Greece and Rome or in antebellum America. Along the way he has some interesting comparisons between ancient justifications of slavery and pro-slavery views in the American South. Though admitting there was no true abolition movement in the ancient world, he makes the case that there was criticism and critique of slavery in the ancient world. The author makes clear his disdain for slavery: “Slavery is the most degrading and exploitative institution invented by man” (p. 5). He says slavery was not universal in the ancient world or the “typical labor system in the ancient Mediterranean world” but admits it cannot be dismissed as “marginal” (p. 5). Slavery was a “structural element” in ancient society (p. 9). For 3,000 years—from the time of Moses to the end of the 17th century—virtually every major statesman, philosopher, theologian, writer, and critic accepted the existence and legitimacy of slavery. The word ‘accepted’ is chosen deliberately, for these men of affairs and molders of thought neither excused, condoned, pardoned, nor forgave the institution. They did not have to; they were not burdened by the view that slavery was wrong. Slavery was considered to be part of the natural scheme of things. ‘From the hour of their birth,’ said Aristotle, ‘some are marked out for subjection, others for rule.’ (p. 9). Ancient views of slavery cannot be limited to the “natural slave theory” of Aristotle (p. 13). Slavery also came to have metaphorical use among early Christians. Garnsey points not just to Plato and Aristotle acceptance of slavery but also others, including early Christians. He points to the sermons of Augustine and John Chrysostom which presume the existence of the slave system. He also cites the will of Gregory of Nazianzus, showing he had been a slave owner. Chapter 3: Justifications of slavery (pp. 35-52). He notes Aristotle’s “natural slave theory” in which he expressed the view that some men by nature were meant to be enslaved and controlled by superior men as their masters. Again, he points to other ancients, including some early Christian writers, who reflected this viewpoint. Chapter 4: Slave systems criticized (pp. 53-63). A number of authors find fault with the slave system as it operated in practice, including the way slaves were treated, and with certain aspects of slave acquisition. The criticisms that are leveled are concrete and raise practical concerns. They are limited in objective and do not question the existence of slavery as an institution. Hence they have to carefully distinguished from what appear to be genuine critiques of slavery (see ch. 6) (p. 53). Chapter 5: Fair words (pp. 64-74). This chapter addresses the labeling of slaves “as inherently bad or stupid (cf. ‘Sambo’)” as “the crudest way of justifying the institution” (p. 74). Chapter 6: Slavery criticized (pp. 75-86). He cites examples of largely anonymous critics of slavery (cited as opponents by men like Aristotle) who attacked slavery. These were “social radicals” (p. 86). Among Christian writers Gregory of Nyssa stands out for his arguments for the abolition of slavery (pp. 80-85). Chapter 7: Slavery eased (pp. 87-101). This chapter deals with how slaves were treated in the ancient world. Garnsey argues that with the rise of Christianity to imperil power “we find very little sign of change in the law of slavery and the way it was administered” (p. 101). Chapter 8: Aristotle (pp. 107-127). Opening: “Natural slavery as presented by Aristotle is a battered shipwreck of a theory” (p. 107). He addresses Aristotle’s assessment that slaves are “tools” used by their masters (p. 122). He saw slaves as “subhuman” (p. 124). Chapter 9: The Stoics (pp. 128-152). “The contribution of Stoicism to slave theory was to shift the focus of attention from legal to moral slavery” (p. 150). Stoicism believed in the rationality of all men (including slaves) and was deterministic. “The message for slaves, explicit in the Late Stoics, was to stay put and serve their masters well. Therein lay moral goodness, and therefore happiness” (p. 151). Chapter 10: Philo (pp. 157-172). Chapter 11: Paul (pp. 173-188). He sees Paul as like Stoics and Philo in adopting a moral view of slavery. “Paul like everyone else accepted legal slavery” (p. 176). He addressed relationships of slaves and masters. “Perhaps Paul’s outlook was no better integrated and no more internally consistent than that of Philo” (p. 188). Chapter 12: Ambrose (pp. 191-205). Ambrose reflects classical views but begins to look at the origins of slavery in sin. Chapter 13: Augustine (pp. 206-219). “In response to the ubiquity of institutional slavery and the inevitability of spiritual slavery of one kind or another, Augustine produced, on the one hand, a moral theology of slavery, or pastoral advice about the way masters and slaves should comport themselves in relation to one another, and, on the other, a dogmatic theology of slavery, or a theoretical statement about the place of slavery in the divine order” (p. 206). He sees the origin of sin in man’s fallen nature. Chapter 14: Slavery as metaphor (pp. 220-235). Christians used slave metaphor for spiritual purposes. The “two worlds” of their theology and Greco-Roman society “seem to me to have intersected surprisingly little” (p. 235).